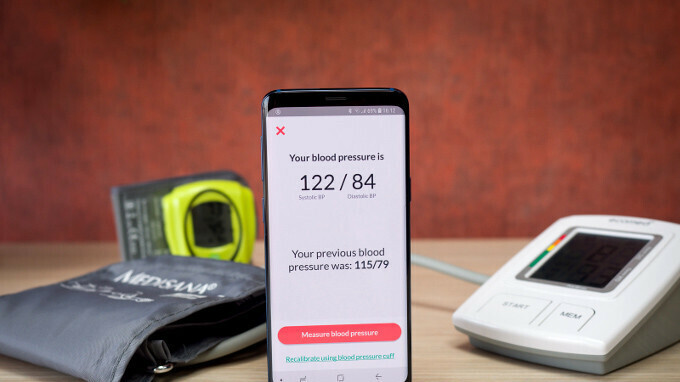 Samsung has big plans for its pulse meters, and the new one on the Galaxy S9 and S9+ "provides richer, more accurate information on users’ health status." How does it do that? Well, there is a new, more accurate optical sensor on the back of the S9 and S9+, for once, which can measure something called the Heart Load Factor, which is a gauge of the real-time demand that is tasked to your heart. Of course, it comes with the usual "intended for general wellness and fitness purposes only" disclaimer, but that's usually all everyone is using those for anyway. The funkier part is that the new heart rate sensor kits on the Galaxy S9 and S9+ are able to take your blood pressure. Yes, you read that right, no arm cuffs, no wrist monitors, just you and your trusted Galaxy S9 after 11 sausages in a row. We kid, but Samsung entered a partnership with the University of California, San Francisco (UCSF) to leverage the "revolutionary optical sensor" on its new flagships by engaging into a pilot study in digital health. The way the optical sensor works, is the way some apps in the Play Store read your BP with the camera and illumination by the LED flash, yet is way more precise than those. We'll spare you talks about Ballistocardiography and Photoplethysmograph readings, but will just say that the optical sensor collects info from your fingertip pulse between heart beats, and runs them through linear regression analysis, set by a baseline reading with a medical-grade arm cuff BP monitor. UCSF has created an app called My BP Lab, which aims to follow the study participants' blood pressure and stress levels throughout the day in the span of a few weeks, using the data for both number crunching, and improving the accuracy of the optical pulse reader on the S9, so that it becomes a viable tool for following your BP. Well, UCSF just released the My BP Lab application, as promised, for the official launch of the S9, and we immediately took it for a spin to measure how precise will the blood pressure measuring abilities of the phone will turn out to be against a regular arm cuff monitor. To a great extent correct, it turned out, but don't throw out your arm or wrist cuffs just yet. Once you create a study participant account in the app, enter your details, and set a baseline measurement with an orthodox arm cuff, then the phone takes over, and we barely noticed a maximum of +/- 5 point difference between the cuff and the handset's readings afterwards, as long as our volunteers were sitting still. With activity, however, the measures were profoundly different. When you exercise, your systolic (the upper reading) measurements can skyrocket, and that is where we logged huge discrepancies between the cuff, and the optical reader measurements on the same baseline. Both arm cuff monitor makers, and the app creators, advise to log your BP in a calm state and sitting, rather than running around with a cuff on your arm, yet it's something to keep in mind if you use the phone to measure the change in your BP reading after rigorous activity or in stressful situations. We also measured the same +/-5 points discrepancy when we logged our BP with another person's baseline, and then controlled it against our cuff measurements, too. Long story short, you shouldn't rely entirely on your Galaxy S9 or S9+ to log any daily BP readings required by your doctor, but for a more relaxed blood pressure tracking, or in emergencies when you don't have the cuff around, the results turned out to be viable, mainly for observing trends and change amplitude. Medical revolution? On the cuff cusp of it just yet, though one of the purposes of the UCSF study is to perfect the algorithms behind the optical reader measurements, so if you want to help science make BP readings on your phone an accurate tool, check out the My BP Lab app from the download link above, and take one for science with your Galaxy S9 or S9+. This just became the most awesome phone ever! As a health nut, these are the actual features and specs I crave. The hell with camera clarity, give me health features galore. I believe in being in tip top shape, and heart health is a major priority for the jedster. Kudos Samsung...major kudos. They won't out of jealousy. Sadly, most "tech boogers" are Apple fanboys and they really really hate giving Samsung credit for anything. Well said. Though its camera is also the highest rated for a smartphone. They kill it with cameras too, both quality, and features. Yes this is great! Hypertension (systolic blood pressure higjer than 140 mmHg and/or diastolic higher than 90 mmHg) is a big risk factor of cardiovascular diseases. It has a high prevalence, but yet most people don't know their (average) blood pressure, as they have never measured it. Almost everyone has a smartphone, so if this becomes widespread, people who didn't know that they have hypertension will know, and they can get medication as it is treatable! This can potentially bring down mortality. It's actually pretty damn accurate for a phone. That's an awesome feature to have, ontop of the already impressive health features of the Galaxy phones, such as oxygen levels and heart rate. I personally A/B tested the oxygen level feature, and it was within 1% of the proffesional medical equipment in the hospital. It's really impressive how many health features there are in the Samsung Galaxy phones and how well they work. I can't think of a single other phone that offers as good and as many health features. I don't think there is anything close. Pretty impressive for a static sensor. Nice work. The s9/+ are awesome phones and now I can't wait to see what the note 9 will be. I'm really hyped for the S10, their anniversary phone. The note 9 is going to be good, but i think they're saving all the fantastic stuff for their anniversary phone. I love the direction Samsung has been heading ever since the S6. This is the only reason why I want an S9, despite its other shortcomings. It's a great feature. Think that you can take your blood pressure during workouts or when stressed...very useful indeed. I hope this becomes more accurate with time as it'd help us greatly! Received my S9+ on Wednesday. I only learned about this feature and the My BP app yesterday. (when the app was released) Ive so far only been able to "check in" three times after much finger adjustment. This current evening "check in" just isnt working. Ive tried everything the app suggests. While its cool to see this tech in a phone, its been a giant pain in the rump to get working. Im not sure if its the app or the sensor but its looking like completing this 3 week reading trial is going to be next to impossible. I also cant seem to find actual BP numbers in this app. Just a +/- % reading Other than that, this is an amazing phone. Traded in my S8+ with zero regrets. How about Blood Sugar measurement? You'll need needle for that.. But probably we'll see affordable costumer-grade needle-less glucose meter in the next 1-2 years, and probably it will need another 3-4 years to make it small enough to put it inside smartphone or smartwatch. One day, a Samsung phone will also be able to do Sperm Count. Kudos to Samsung for these health features!